Similar to our BR-65, but with the added flexibility of a deep cutaway and onboard Fishman electronics, the BR-65CE really does excel in any performance setting. Perfectly at home in the privacy of ones home, or on the largest stage plugged into the most sophisticated sound system, the BR-65CE has now sonic boundaries! The unique body shape offers a unique and more complex tonal pallet than any 000 or Dreadnaught, while still having a voice that fits any musical genera. 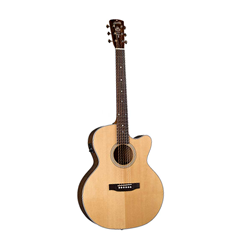 From singer songwriter, to fingerboard pyrotechnician, Blueridge offers the perfect guitar for everyone!